I'm an avid reader, literacy advocate, poet, and long time independent bookseller at Old Firehouse Books in Fort Collins, Colorado. When I'm not reading or recommending books I spend my time writing them. While I read a variety of genres I primarily focus on curating the poetry and science-fiction sections at my store, which is where I focus most of my reading attention. I also have a soft spot for a good teen read, and enjoy digging into graphic novels whenever I get the time. This was the surprise book of the year for me. When my book club selected this for our reading list I pretty much immediately decided it would be my skip for the year - I don't like giant doorstoppers and I hate spiders, so a 600 page epic about space spiders sounded dreadful. As the date grew closer I decided I'd give it a shot, giving myself permission to bail at any moment without guilt (I finish almost every book I start). And guess what? I finished it. Not only that I really enjoyed it. This book is classic hard sci-fi. Full of weird science, alien worlds, and a slow build. Alternating chapters between the humans of a generation ship and the spiders of the green world you get two distinct plot lines that promise to eventually intersect. The human side of the story evoked a bit of a time travel story for me as the central character continually exits cryosleep to discover his "world" has changed and moved forward in unexpected ways. The spider side of the story actually became my favorite as you watch their civilization evolve over many many generations, one genetic line remaining our constant thread (no pun intended). This book is a very slow burn. The thing that took me most off guard was how the two plot lines stayed separate for so long. I was expecting the book to be about the clash between these two cultures, but instead it is an exploration of them so that once they do meet you can fully understand where both are coming from. I quite enjoyed the ending, which I think I would have scoffed at had it not seemed so earned. This book takes its time, but that's an important component of what makes it effective. I actually found myself emotional from time to time about the lives of spiders, something I never thought I'd say. 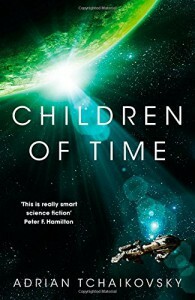 If you're longing for a good old fashioned hard sci-fi with a focus on world building and cultural anthropology you won't want to miss this book. It kept me invested and curious all the way to the end.